Surgeons and interventional cardiologists at the University of Michigan Frankel Cardiovascular Center have consistently been at the forefront in the treatment of aortic stenosis, offering comprehensive options to treat the disease. 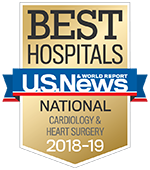 Early on, the Frankel Cardiovascular Center (CVC) was among a select group of U.S. hospitals using transcatheter aortic valve replacement (TAVR) procedures to replace a patient’s diseased aortic valve without heart bypass or open-heart surgery. Once deemed a treatment for patients at high risk for open-heart surgery, and only through clinical trials, TAVR is now being offered as an option for moderate- and low-risk patients, in many cases without their participation in a clinical trial. One of the first TAVR options offered by the Frankel CVC was the Edwards SAPIEN Heart Valve, approved in November 2011. The Edwards SAPIEN Heart Valve was developed for patients considered too high risk for traditional valve replacement surgery, often due to age or frail health. The goal of aortic valve replacement for these high-risk patients is not only to improve their chances of survival but also to enhance the quality of their lives. Seven out of every 10 inoperable patients with severe aortic stenosis were alive one year after the TAVR procedure. In comparison, only five out of every 10 patients who did not receive a new valve (part of the control group) were alive at one year. Patients treated with the Edwards SAPIEN Valve had improved heart function and improved quality of life at one year, as compared to patients not treated with the valve. The Medtronic CoreValve System, approved in March 2015, involves two trials: one for high-risk patients and one for intermediate-risk patients (also focused on testing TAVR for use among the general population as an alternative to open-heart surgery). The CoreValve procedure allows access to the diseased aortic valve via an artery in the leg and is designed for patients with severe aortic stenosis who are at high risk for surgery due to age or other health issues. The Frankel CVC was one of the first heart centers in the U.S. to enroll patients in the Medtronic CoreValve Surgical Replacement and Transcatheter Aortic Valve Implantation (SURTAVI) trial, for aortic stenosis patients who are at intermediate risk to undergo open-heart surgery. Today, not only is TAVR the established therapy for inoperable patients with severe aortic stenosis and an alternative to open-heart surgery in high-risk patients, it has become an option for intermediate- and low-risk patients as well, due to the lower risk of minimally invasive treatments and shorter recovery time. To learn more about TAVR today, visit our Transcatheter Aortic Valve Replacement page. To make an appointment to discuss your need for aortic valve treatment, contact us toll-free at 888-287-1082 or visit our Make an Appointment page for more information about what to expect when you call us.